The “Men Without Pants” ad makes a statement about modern masculinity, or lack thereof. The anti-anthem commercial dramatizes the ridiculous behavior of a group of men not wearing pants. These proud but childish men march through a field with purpose while singing “I Wear No Pants” and are interrupted with a notice to mankind: “Calling all Men – it’s time to Wear the Pants”. The takeaway of the ad is that men might see a glimmer of themselves in the pant-less parade and make the decision to “Wear the Pants,” both literally and figuratively. Dockers partnered with Shazam, a mobile music discovery application provider, enabling viewers to engage with the ad’s content on their smartphones. 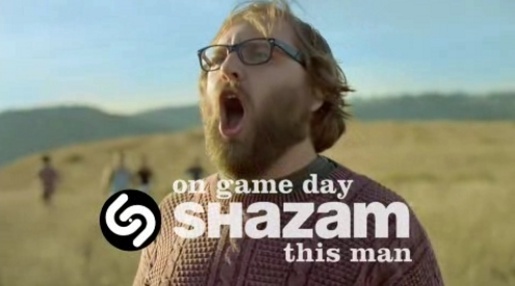 Viewers who have Shazam® downloaded on their smartphones can tag the spot and enter to win a free pair of khakis, instantly purchase the original “I Wear No Pants” song by The Poxy Boggards, read about the “Wear the Pants™” campaign and more. 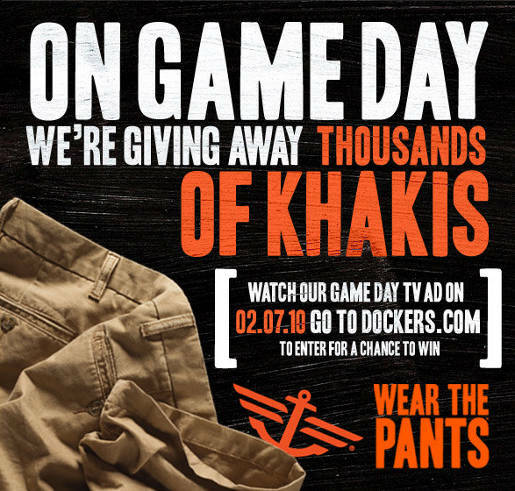 The khaki giveaway runs from February 7 – 15, 2010. Download the Shazam app from iTunes: Shazam – Shazam Entertainment Ltd. In early 2009, the Dockers® brand discovered a number of facts that indicate men are facing challenges in modern society, especially in the areas of education and employment. This information inspired the new “Wear the Pants” campaign. New studies and articles have been published that suggest the Dockers® campaign has tapped into an emerging societal issue that is rapidly gaining attention among academics and the news media. The latest information includes a study from the Pew Research Center about the Rise of Wives, a story in The New York Times about men marrying wealthier women,, and an NPR piece about the Human Male: Still a Work in Progress. The Wear the Pants™ campaign and television commercial were created by Draft FCB, San Francisco, by creative directors Julie Scelzo and Desmond LaVelle, art director Nic Howell and copywriter Jess Davis. The innovative integration of Shazam® was developed in partnership with Ignition Factory, a creative media specialty unit of OMD“>OMD media agency. Filming was shot by director Noam Murro via Biscuit FIlmworks with director of photography Toby Irwin, senior executive producer Shawn Lacy, executive producer Colleen O’Donnell, line producer Scott Kaplan and production designer Brock Houghton. Editor was Avi Oren at Bikini Edit with executive producer Gina Pagano. Graphic Design was done at Prologue Films by creative director Georgia Tribuiani, creative director Henry Hobson, animator Gary Mau, editor Brant Duncan, producer Elizabeth Newman, executive producer Kyle Cooper. Sound was produced at One Union by senior engineer Joaby Deal, engineer Matt Cohen, assistant engineer Chris Avery, president John McGleenan and studio manager Lauren Mask. The song, “I Wear No Pants,” was written by Los Angeles-based band The Poxy Boggards, and included on their 2006 Celtic music album, Liver Let Die. They have have produced their own music video to go with the song, along with an EP with two new versions. Download the 2010 track from iTunes: I Wear No Pants – Liver Let Die.